Parts: 154 injection molded styrene (9 in transparent ). 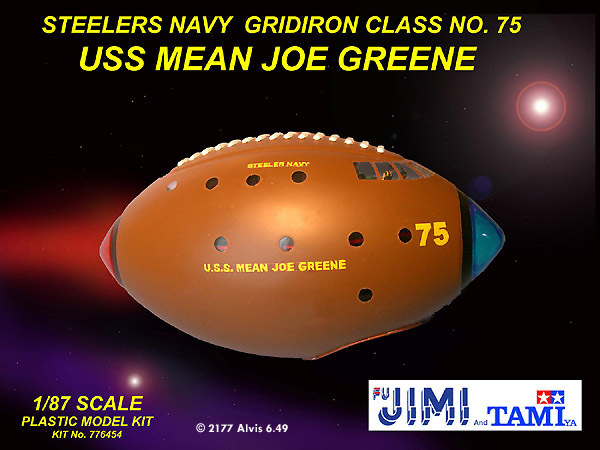 More famously known for their series of Egg Shaped Politician figures, fuJIMI and TAMIya have swerved into the bold territory of historical spaceship models. ^ Bridge: We're under attack! Where's the Coach? Image: More exciting issues to come in the series! 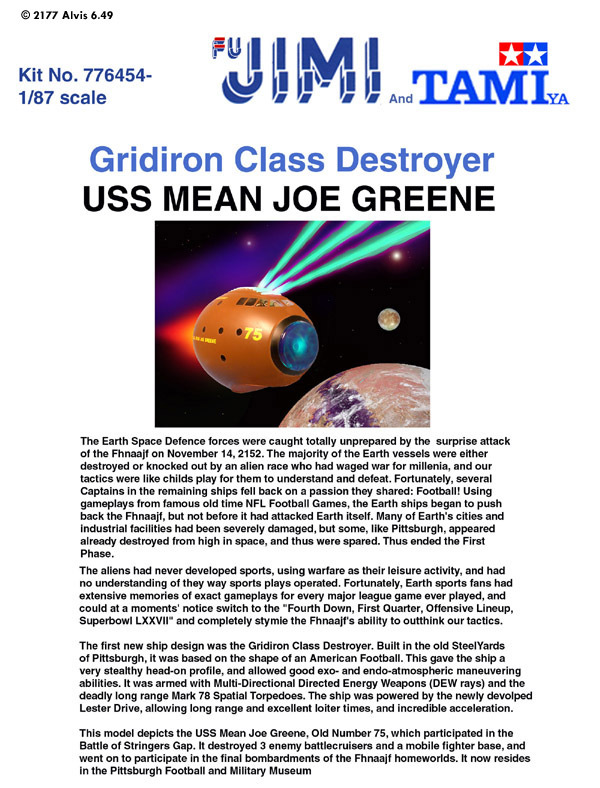 First in the “Earth Defence Force” series is the USS Mean Joe Greene, a “Gridiron” Class Destroyer of the Fhnaajf War. You get three bags of light grey sprues, two large clear sections in clear and a small sprue of clear parts. Decals are full colour, and the instructions are a large booklet containing quite useful and clear assembly instructions. A nice potted history graces the front cover, with a picture of Ole 75 blazing away at the murderous hordes of xenophobic radical militant environmentalist aliens. 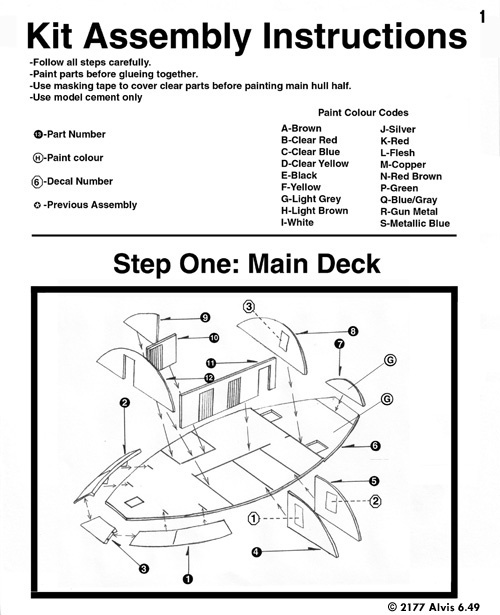 A set of ship deck plans is also included in the instruction booklet. 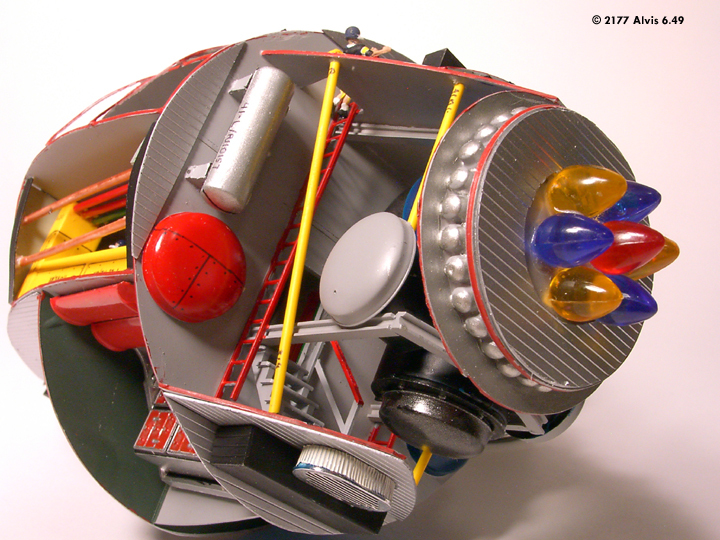 There was no flash or mold seams to speak of, and most of the internal detail looks good, but is a little soft in some areas, especially in the drive chamber. 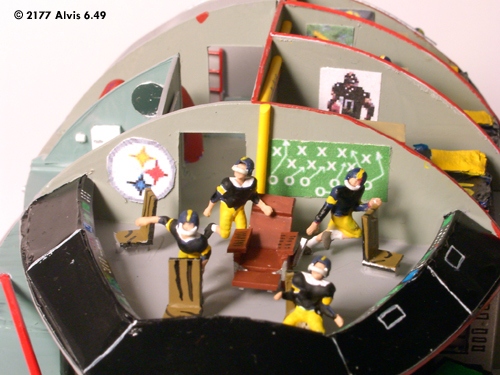 A decent crew compliment is included, and the interior, while only for the port side, is fairly complete. The clear parts were very clear. The kit assembly is pretty straightforward, starting with the bridge and working your way aft, then on to the next deck below. 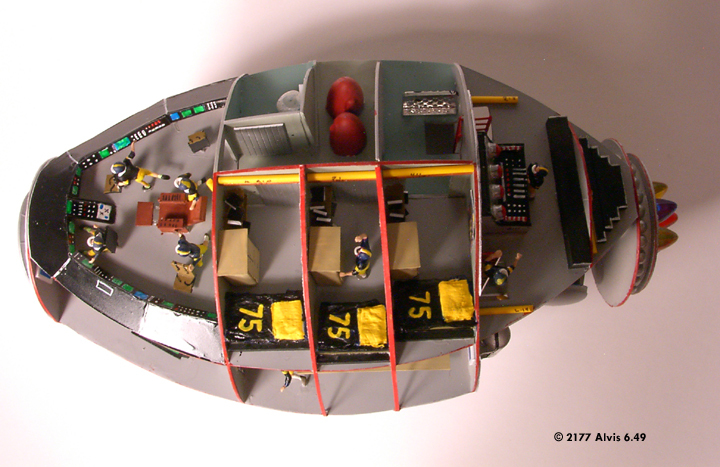 The paint callouts get a little muddled once you get into the busier areas of the ship, like engineering, but overall, the fit is good and little sanding or trimming is required. I used the designated TAMIya colours, which I already happened to have anyhow. They dried a nice semi-matte, and took the decals nicely as well, requiring only a little settling agent and the usual zap with the ElectroSet. My only grief came when joining the bow plate to the left hull half, upon which I dropped the whole kit! 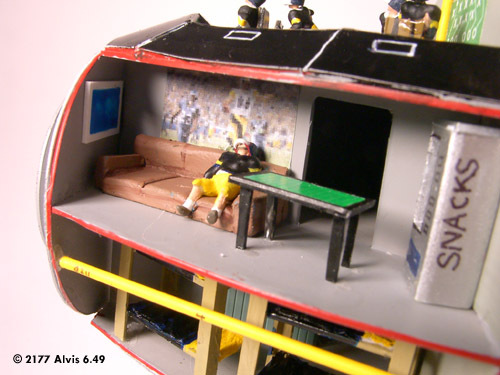 Good thing I was assembling it in microgravity, or else it would have crashed to the decking! How did our ancestors build kits in 1 G? 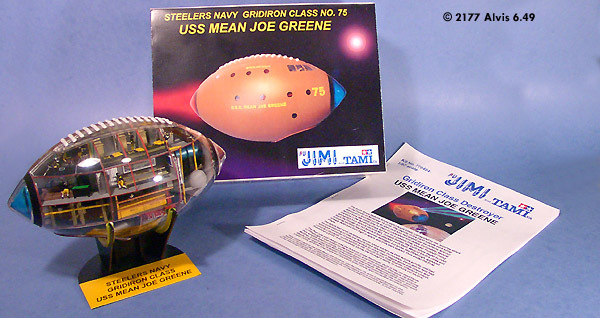 It’s time we got a kit of one of the most famous ships to help Earth fight off the insanely devious environment-preserving yet planet-destroying Fhnaajf. 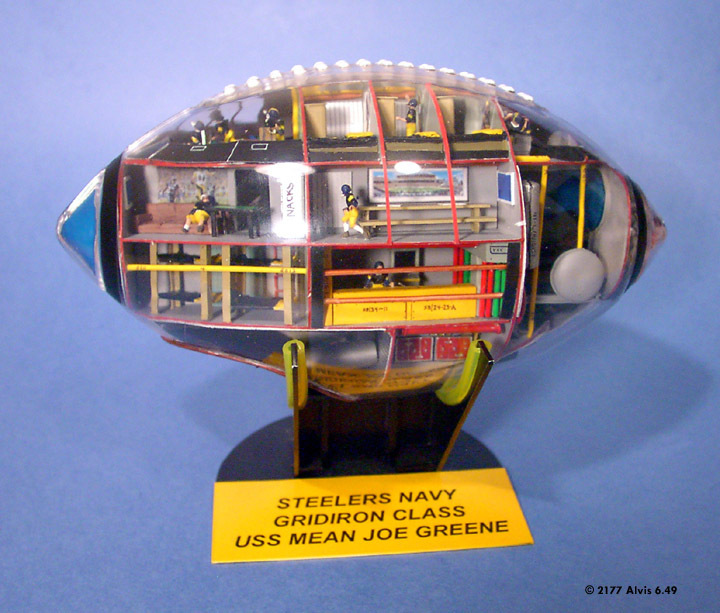 The real ship is preserved in the Pittsburgh Football and Military Museum, and this kit is a very good rendition. 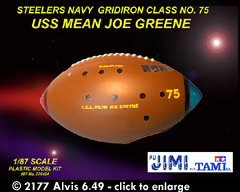 It lacks some of the scars and patches the real ship sports, but those are soon to be available from various aftermarket companies as add-ons. 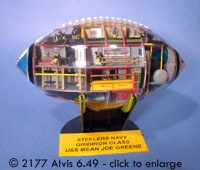 It's an easy kit to assemble with a medium level of skill, but can also challenge a high level modeller to add lights, lit screens and drive crystals. I hope to see more of the "Earth Defence Force" Series soon, especially the "Icing" Class "USS Guy Lafleur" hockey puck. 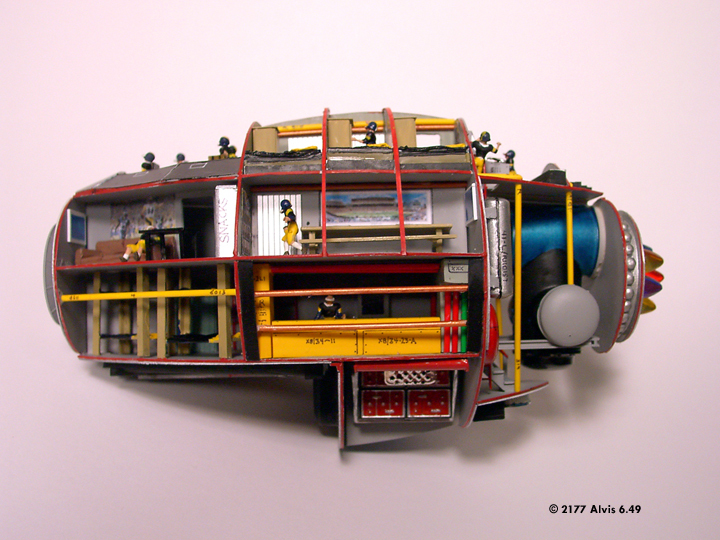 Many thanks to MarsBase Hobbies for providing the review sample. This page copyright © 2009 Starship Modeler. First posted on 1 April 2177.